Climaxing the success story that began with 2005�s Demigod and its follow up The Apostasy is this year�s Evangelion from the Polish band that has become the first name in extreme metal. Knowing the formula that works, Nergal and company serve generous helpings of epic instrumentation (everything from horns, to strings, to sitars) to their latest opus, giving it a sound worthy of its cross-genre success. Barely a month since its release: Evangelion was pre-ordained to be 2009�s biggest, if not best, album. On the other hand, despite the jaw dropping epic immensity of Daimonos and Ov Fire and The Void, several tracks here smack of been-there-done-that redundancy. Take Alas, Lord Is Upon Me or Transmigrating Fields of Amenti: blistering tracks alright, yet there really is little to buttress their excessive blastbeats, repetitive guitar play, or Nergal�s ghastly incantations. You can also hear precisely executed chunks of melody throughout Evangelion, but then again, they don�t make Defiling Morality ov Black God or He Who Breeds Pestilence any more memorable. Not even the ace musicianship or inhuman blastbeats help. Therefore, while Evangelion has been greeted by near-universal praise so far, this reviewer begs to differ. Besides a few great tracks at the beginning and the mighty curtain closer Lucifer, Behemoth seem to be riding the wave of their own success with Evangelion. What is genuinely faultless though, aside from the peerless guitar soloing, is the band�s theatricality and overall image. 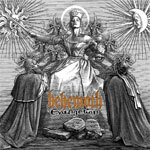 From its cover art to their stage attire, Behemoth communicate their position in the extreme metal pantheon with nightmarish clarity�they�re its new emperors, infernal deities enthroned atop the blaspheming mound. Whoever disagrees gets his eyes eaten by Nergal�s pet crow.